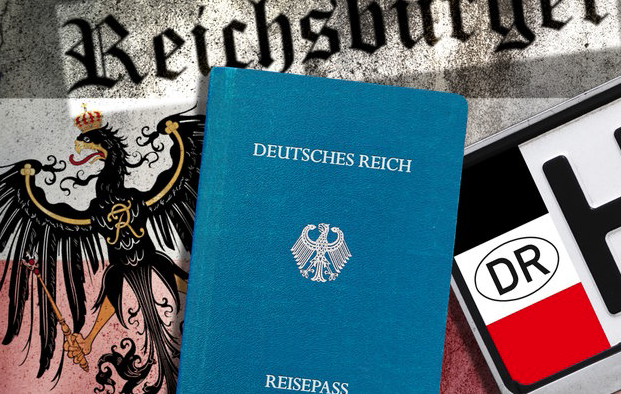 By Ian Allen IntelNews: Adherents of a bizarre far-right movement in Germany, who claim to be citizens of Prussia, are arming themselves and pose a growing security threat, says a new report by the country’s domestic spy service. The members of the movement call themselves Reichsbuerger (“citizens of the Reich”) and reject the legitimacy of the Federal Republic of Germany. Instead of the modern-day German state, which emerged in 1990 from the union of East and West Germany, Reichsbuergers swear allegiance to the Deutsches Reich (German Reich), the Nazi German state that existed between 1933 and 1945. They also claim that the Deutsches Reich, which they occasionally refer to as Prussia, continues to exist in its pre-1945 state and is still governed by a provisional government in exile. In some cases, Reichsbuerger adherents have contacted foreign embassies in Berlin and asked to be recognized as citizens of the Third Reich, but without success. In addition, some Reichsbuerger associations issue Deutsches Reich identification cards and Deutsches Reich car license plates. But these are dismissed as “fantastical” by German authorities, who have historically refused to take Reichsbuerger adherents seriously. But now the Federal Office for the Protection of the Constitution (BfV), Germany’s main domestic security agency, has said that the Reichsbuerger movement is growing and needs to be viewed as a potential security threat. According to the BfV’s annual report, which was published on Tuesday, the Reichsbuerger movement has grown by more than 65 percent since 2016 and currently consists of approximately 20,000 committed members. In its report, the BfV notes that the numerical growth of Reichsbuerger adherents may be partly attributed to the heightened attention that German authorities have been paying to far-right organizations in recent years. The agency also states that only about five per cent of Reichsbuergers may be described as violent or potentially violent extremists. However, violent Reichsbuergers have risen from 500 in 2016 to 900 in 2017, an 80% increase in a year, according to the report. Moreover, says the BfV, many core members of the Reichsbuerger movement maintain close contacts with German far-right criminal networks, whose members include current and former supporters of the National Socialist Underground (NSU). Earlier this month, several NSU members were found guilty of having participated in 10 politically motivated killings of immigrants between 2000 and 2007. The BfV report states that Reichsbuergers increasingly view the NSU’s violent acts as examples to follow, and that they are systematically attempting –and usually succeeding– to obtain gun licenses. In a report published earlier this year, the BfV had warned that the Reichsbuerger movement was trying to build an army.